1 Hifi-Rack, 4 adjustable furniture feet, assembly material and instructions (delivery without displayed decoration)Additional Glass Shelf (Art-No. 6411) available here. 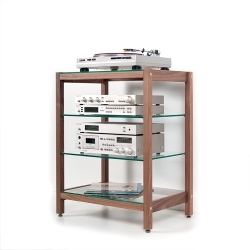 Solid wood hifi rack made of walnut in combination with toughened glass. The side frames are firmly glued and are connected with the cross squares by the means of stable, nickel-plated screws. The glass panes are placed on top and bottom of the frame. 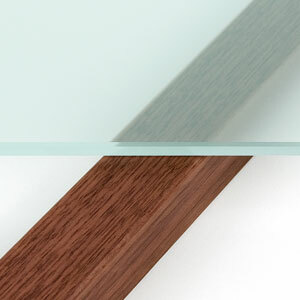 The middle glass shelves are variable and fixed at the desired height with clamp-glass shelf supports. The hi-fi rack QUADRA is the ideal hifi rack for your hi-fi components. Whether amplifier, record player, tuner or CD player - with the adjustable shelves all devices can be optimally accommodated. 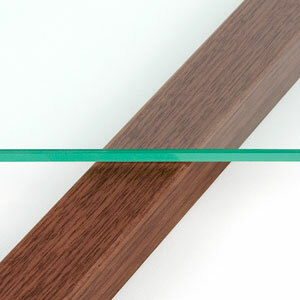 The wooden elements are made of high-quality, solid walnut wood. The adjustable furniture feet ensure maximum stability.